It was clean, nice, and easy. It was a great stop on the way to Pinnacles National Park. Decent place to stay on the way to LA. Room small but pleasant. Parking lot and exterior a little run down. Where to find Kettleman City hotels near an airport? Where can I find hotels in Kettleman City that are near tourist attractions? Although there are no Expedia hotels in Kettleman City, there are 3 options within a 0.1-kilometre (0.06-mile) radius. 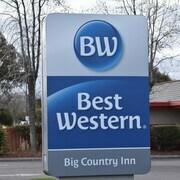 The nearest Expedia-listed hotel is the Best Western Kettleman City Inn & Suites, San Joaquin Valley, which is located 18 kilometres (11 miles) from the middle of Kettleman City. 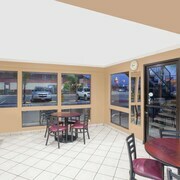 Alternatively, check out the Americas Best Value Inn, located in San Joaquin Valley, which is 18 kilometres (11 miles) away. Coming from the center of Kettleman City, it is 25 kilometres (15 miles) to the Corcoran Country Inn. Time permitting, you should explore more of Central California. Nature lovers will appreciate Central California's valleys. In addition you could head to a few of the area's lighthouses. Adventurous travelers might try their hand at snowboarding and skiing here. 70 kilometres (42 miles) to the north of Kettleman City is Selma, where you can enjoy Brentlinger Park and Selma District Chamber of Commerce. The Holiday Inn Selma - Swancourt and Best Western Colonial Inn are a few of the Expedia-listed hotel and apartment options in Selma. 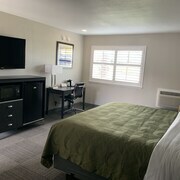 90 kilometres (55 miles) to the north of Kettleman City, you can also stay at Fresno, home to the Holiday Inn Express Hotel & Suites Fresno South and DoubleTree by Hilton Fresno Convention Center. If you're staying in Fresno, make sure you visit the Fresno Art Museum and Save Mart Center. Get your sporting fix with a trip to Rabobank Arena, which is 95 kilometres (58 miles) to the southeast of Kettleman City. Stay near the action at the Holiday Inn Express and Suites Bakersfield Central or the Residence Inn by Marriott Bakersfield. 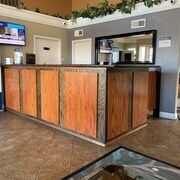 For travelers arriving or departing via Visalia Municipal Airport, you might like to stay at Wyndham Visalia, or Comfort Inn & Suites Visalia - Sequoia, which are both close. What are the most popular Kettleman City hotels? Are there hotels in other cities near Kettleman City? 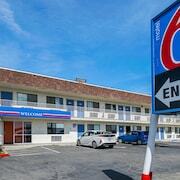 What other types of accommodations are available in Kettleman City? Explore Kettleman City with Expedia.ca’s Travel Guides to find the best flights, cars, holiday packages and more!